OTD, January 31, 1865, Americans make amends as Congress passes the 13th Amendment. The words of the Declaration of Independence that “all men are created equal” is consistently applied. 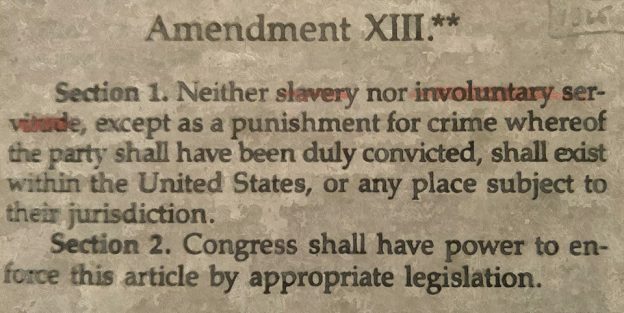 I was sharing with my daughter the story of the Thirteenth Amendment since my home state played such a huge role in its passage. Senator Lyman Trumbull from Illinois, who was a co-author of the amendment, telegraphed Illinois Governor Richard J. Oglesby moments after President Lincoln approved the Amendment earnestly encouraging the Legislature of the President’s home state to be the first to ratify. The did it that very day. By the end of that February day, Illinois became the first State to ratify the Thirteenth Amendment. During that same session the horrible “Black Laws,” which were in force since the state’s birth, were also repealed. The 13th Amendment to the U.S. Constitution became part of our Nation’s governing document on December 6, 1865. My little girl is proud of our home state and so am I. I know you are too. This entry was posted in Uncategorized on February 1, 2019 by dsheridan.